Enhance virtually anything you do with powerful GDDR5 discrete graphics. Available on select models. 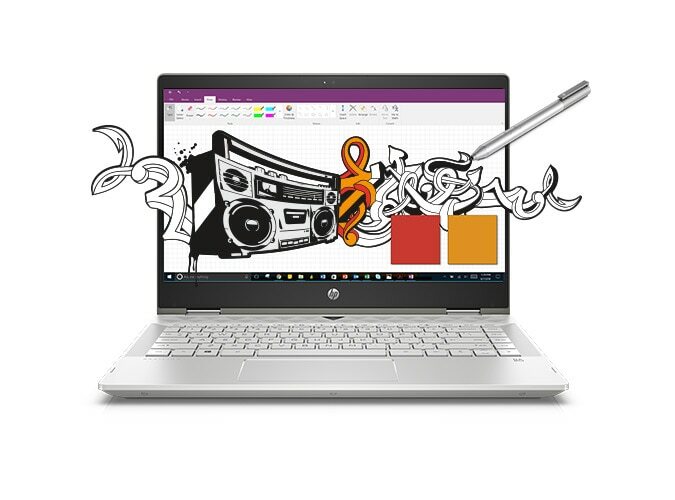 Boot up fast with up to 512GB SSD and store more of what you love with up to 1TB HDD.4 On select models, 16 GB of Intel® Optane™ memory14 for storage acceleration is also available. A durable 360-degree geared hinge gets you in the perfect position to work, write, watch and play. 1. Pen is optional and sold separately. 3. Internet service required and not included. 4. For solid state drives, TB = 1 trillion bytes. Actual formatted capacity is less. Up to 35GB of system disk is reserved for system recovery software. 5. Battery life will vary depending on various factors including product mode, configuration, loaded applications, features, use, wireless functionality, and power management settings. The maximum capacity of the battery will naturally decrease with time and usage. See https://bapco.com/products/mobilemark-2014/ for details. 6. Windows 10/ MM14 battery life will vary depending on various factors including product model, configuration, loaded applications, features, use, wireless functionality, and power management settings. The maximum capacity of the battery will naturally decrease with time and usage. See https://bapco.com/products/mobilemark-2014/ for additional details. 7. HP Total Test Process testing is not a guarantee of future performance under these test conditions. Damage under the HP Total Test Process test conditions or any accidental damage requires an optional HP Accidental Damage Protection Care Pack. 8. Weight and system dimensions may fluctuate due to configuration and manufacturing variances. 9. Not all features are available in all editions or versions of Windows. Systems may require upgraded and/or separately purchased hardware, drivers, software or BIOS update to take full advantage of Windows functionality. Windows 10 is automatically updated, which is always enabled. ISP fees may apply and additional requirements may apply over time for updates. See http://www.microsoft.com . 10. Features may require software or other 3rd party applications to provide the described functionality. 11. Wireless access point and Internet service required. Availability of public wireless access points limited. The specifications for the 802.11ac WLAN are draft specifications and are not final. If the final specifications differ from the draft specifications, it may affect the ability of the notebook to communicate with other 802.11ac WLAN devices. 12. Full high-definition (FHD) content required to view FHD images. 13. Optional on select models. 14. 7th Generation Intel® Core™ i processor or later required. Intel® Optane™ memory system acceleration does not replace or increase the DRAM in your system.